This section describes advanced configuration options such as installing components in non-default locations and changing other default properties. Man pages with component options are described in Section 12. Note: To change the port of the consumer, see Section 6.7. The Inca depot uses Hibernate to interface to a relational database backend for storing reports and incat configuration. By default, the Inca depot uses Hibernate's HSQL database but can be configured to use any Hibernate supported database. We have tested the Inca depot with PostgreSQL and Oracle. Uncomment the block which specifies for hibernate to use your database (i.e., for PostgreSQL uncomment 8-13, for MySQL uncomment 17-21, for Oracle uncomment 24-28). Change the uncommented hibernate.connection.url, hibernate.connection.username and hibernate.connection.password property values to be the host/db name, login username and password for your database. Step 1: (optional -- one time only) Customize email message sent to resource administrators. Step 4: Generate a certificate for the reporter manager. Step 6: Install certificate and trusted certificate. 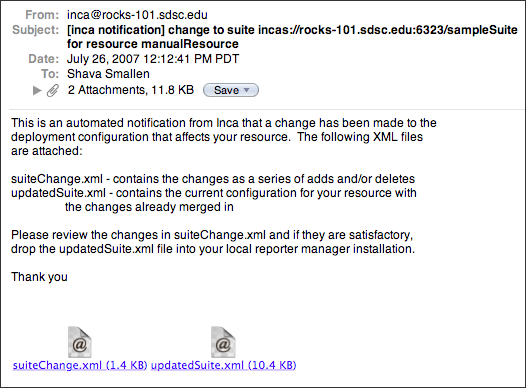 INCA ADMIN: (optional -- one time only) customize the email message that gets sent to the resource administrators by editing the text in $INCA_DIST/etc/manualEmail.txt. RESOURCE ADMIN: install the reporter manager distribution on your resource using the following steps. RESOURCE ADMIN: create a set of credentials for the reporter manager (i.e., private key and certificate request) using the command below. Enter a password for your key (to use when you start up the reporter manager). Two files will be created in $RM_INSTALL_DIR/etc: an encrypted private key called rmkey.pem and a certificate request called rmreq.pem. Email rmreq.pem to your Inca administrator and they will generate a certificate for your reporter manager. INCA ADMIN: upon receiving a rmreq.pem file, generate a certificate for a reporter manager using the command below. Replace "rmreq.pem" with to the path to the rmreq.pem file that you received from the resource administrator and "rmcert-resource.pem" with the path to the reporter manager certificate that will be generated by the command. The "Resource Admin Email" field should be filled with the email address of the resource administrator of the manual resource. Make sure the "Equivalent" box is checked, otherwise the depot may discard reports with "unattached to any DB config" warnings. The new "manualResource" will also need to be added to the "defaultGrid" resource in order to run the default sampleSuite. When suite changes are committed in incat, the agent will email the suite changes to the resource administrator. Select "Agent->Commit" from the menu to commit the changes. RESOURCE ADMIN: install the certificate and trusted certificate from the Inca admin in your reporter manager installation. Replace "rmcert-resource.pem" and "trusted.0" with the names of the files received from your Inca administrator. RESOURCE ADMIN: The suite and any changes to that suite are emailed to the resource administrator specified by the Inca administrator in Step 5. The changes will be attached in a file called suiteChanges.xml and the updated configuration for your resource (with the changes included) will be attached in a file called updatedSuite.xml. View the add/delete changes in suiteChange.xml. Then copy the updatedSuite.xml to a file called $RM_INSTALL_DIR/suite.xml. Figure 21 shows an example of a notification mail viewed from Apple Mail. Command will hang until the password for the reporter manager key is entered. If the private key is not password protected, don't use the -P option in the command above. Check to make sure the reporter manager is running by doing a "ps | grep reporter-manager" and make sure there aren't errors by doing a "grep ERROR $RM_INSTALL_DIR/var/*". NOTE: The resource administrator will need to replace suite.xml with any changes that are received by email, edit the repository.xml with any new reporters, and then restart the reporter manager. Oftentimes resource or system administrators will want to show that a problem has been resolved by independently executing inca tests before they are scheduled to run so that their results appear on status pages. Rather than granting resource administrators full privileges just to use incat's "run now" button, the inca administrator can provide resource administrators with a "manual run now" option - a command line script to execute tests and send results to the depot. The instructions below need to be done *once* by the Inca administrator on each resource where the resource administrator would like to manually run tests. To allow system administrators or others to execute tests with their own password, copy the reporter manager key and cert for them and change the password. The old password is the same as the password used in the createauth step of installing inca. Log into the inca account on the desired resource and change to the $INCA_DIST directory. Check for errors in $INCA_DIST/var/run-now.log. Wait about 10-15 minutes to view the result on your inca status page (data is cached and takes a few minutes to update). Source distributions of the Inca components are also available. The following table lists the Inca component source distributions and shows how to build each of them. Note, that Apache Ant is needed for the Inca components implemented in Java.